Blondie and Brownie: Travels with Brownie: Eritrean Food in Portland, Maine?! Travels with Brownie: Eritrean Food in Portland, Maine?! After checking out some Yelp recommendations we ordered the Zegenie Beghie or Fiery Lamb Stew and the Shiro--roasted, ground chickpeas and red pepper cooked with fresh garlic and "earthy spices." The entrees were served family style on either a plate of injera with salad & either red lentil stew in a red pepper sauce, cabbage carrots and potatoes in a mild yellow sauce or collard greens and kale in a mild yellow sauce. Lawman and I decided to get the red lentil stew and the collard greens. The lentil stew was tasty though not quite as spicy as our go to lentil stew, Misir Wett from Brooklyn's own Ethiopian restaurant, Ghenet. The collard greens were excellent and the Shiro was . My favorite dish of the evening was the lamb stew. The lamb was super tender and it had a great spicy finish while the injera was probably the lightest and fluffiest injera I've ever had, not to mention the mildest. When they first brought us our platter, I was convinced that we'd still be hungry, but it more than filling and for under $30 including tax and tip, it's hard to do much better. We'll definitely be making a return visit! This is great intel as my wife and I are doing a road-trip for our first anniversary with a stop in Portland, ME. Planning on hitting Miyake for their omakase, D.B. Street & Co. for the Lobster Diavolo for 2, One Fifty Ate for tasty breakfast sandwiches, Lobster Shack for a roll with a view, Blintiff's for all-day brunch, and maybe a pastry or two from Standard Baking Co. Thinking we can fit all of that in 36 hours? Hehe. Also we're looking for any recs on non-food stuff to see/do while in Portland. It'll be in August and we'll be arriving on Wednesday afternoon/evening and leaving for Boston Friday morning. Thanks!! @mr. micro: Sounds like a fantastic trip! August is an ideal time to visit Maine. Two Lights in Cape Elizabeth is a very pretty nearby stop and they have a lobster shack there that serves up some good fare. Should be very pretty in the summer and will put you right on the water. The Portland Museum of Art puts on some nice shows. Walking around the Old Port is always fun--lots of shops to poke around in. Not sure what the schedule is, but I know they have events in Deering Oaks Park in the summer--maybe you can catch a show or a concert. Have a terrific time and HAPPY ANNIVERSARY! 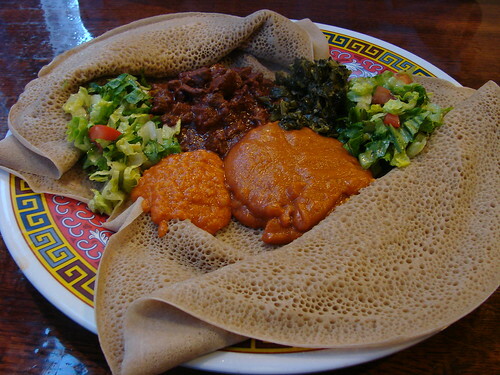 @thoughtful plate: I've been to a few of the Ethiopian restaurants in the city Meskerem in the village and Hell's Kitchen and Ghenet (both in it's old Mulberry Street location and their Brooklyn location). Ghenet is my favorite thus far. Their misir wett is awesome. Do you have a fav Ethiopian place in the city?